Mark Eugene Meyer passed away on Saturday, March 16th, 2019 at the age of 53. The son of Dennis and Sharon Palmer Meyer was born October 3, 1965, in Falls City. As he became older, he began attending Falls City elementary. Around the age of eight Mark and his family moved to the Tulsa area. There he would visit Cooper and Foster elementary before starting High School at East Central. He was a member of the graduating class of 1984. After graduation Mark began working full time as a meter reader for the City of Tulsa. One summer after a week of hard work, Mark decided to go jet ski riding at Oologah Lake, this trip ended up more eventful than any other. It was during here that he first met Selina Ferrell. They began dating and married on May 12, 1990, in Claremore. They made their home in Jenks, and in 1991 their daughter was born, and they decided to move to Claremore. Over the next several years Mark continued working for the City of Tulsa. Things changed in 1998 when Mark was accepted into the Tulsa Fire Academy. This was his dream job. After completing the academy, Mark began his career on C shift and station 30. 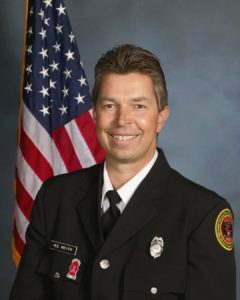 Over his career, he also worked at station 21, and 31 before retiring in September of 2014. In his spare time, Mark had many other hobbies he enjoyed. Trips to the beach were among his favorites. He also enjoyed watching sports, especially the Oklahoma Sooners. He made many trips to bowl games throughout the years. There was also the yearly fantasy football leagues, buying and selling just about anything, and most recently his desire to raise cattle. Survivors include his wife, Selina Meyer, daughter, Kinsey Blunt and husband Brenden; grand-daughter, Taylee Ember Blunt; parents, Dennis and Sharon Meyer; brother, David Meyer; sister, Amy McClain and numerous other extended family and friends. Funeral service for Mark Meyer will be held 11:00 a.m Thursday, March 21, 2019, at the Claremore First Baptist Church. Burial will follow at Oakhaven Memorial Gardens. Visitation will be held on Wednesday, March 20, 2019, at MMS-Payne Funeral Home from 4-8 pm. View and sign Mark’s online memorial at www.mmsfuneralhomes.com.